Compared with about 20 years ago, when boating was still mostly considered a man’s way of escaping everyday life, today it’s not uncommon to see yacht owners cruising with their children, or even grandchildren. There’s still a bit of a disconnect, though, in the way some of these owners have their yachts designed. Despite setting aside a room in their homes for the kids to play, when it comes to their yachts, it’s pretty clear it’s solely a grown-up domain. Expensive artwork perched on pedestals risks coming crashing to the ground if young ones go dashing by (as they often do). Lush silk carpets stretching corner to corner would get ruined in a heartbeat by the errant squeeze of a juice box. And the exquisitely crafted tables and other furnishings at the small set’s height have sharp corners or extended legs that will send a toddler tumbling. Now, we’re not suggesting owners go out and get the tools of the childproofing trade, nor have their crew chase after the wee ones with paper towels and bandages ever at the ready. But, it does make you wonder why there isn’t common ground to be had. 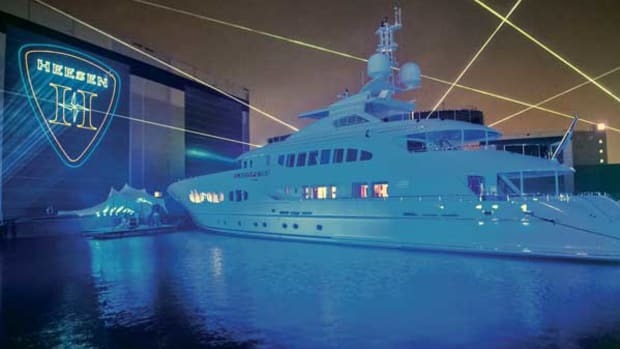 Actually, there is, and it comes in the form of the latest delivery from Heesen Yachts, Lady Petra. This is a yacht conceived for three generations to enjoy each other’s company, yet still has spaces devoted to the adults. 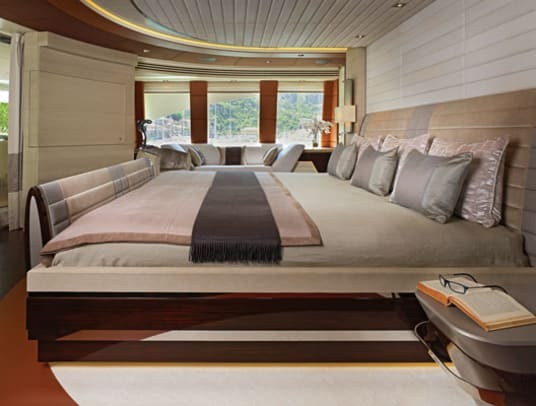 Indeed, even with a decidedly sophisticated décor, all of the areas on board this 153-footer are designed to be approachable for adults and kids alike. Frans and Petra Heesen also like classic, contemporary design, and they knew exactly which design firm could marry that with the family concept: Bannenberg & Rowell. 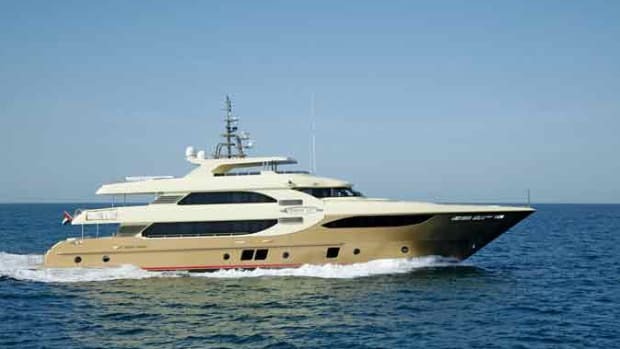 They were especially attracted to what partners Dickie Bannenberg and Simon Rowell had done on the Heesen Elandess, delivered in 2008, and the Trinity-built Bacarella in 2009. 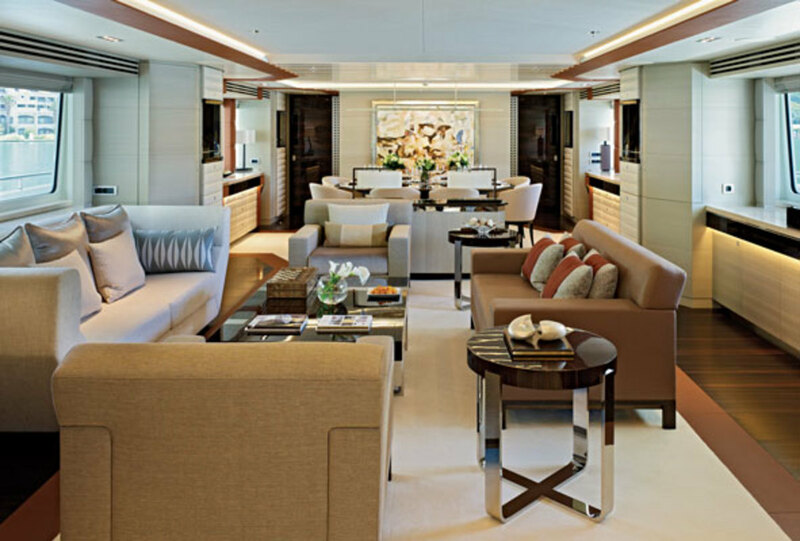 A variety of materials were mixed together on each yacht, making for a warm, welcoming atmosphere. 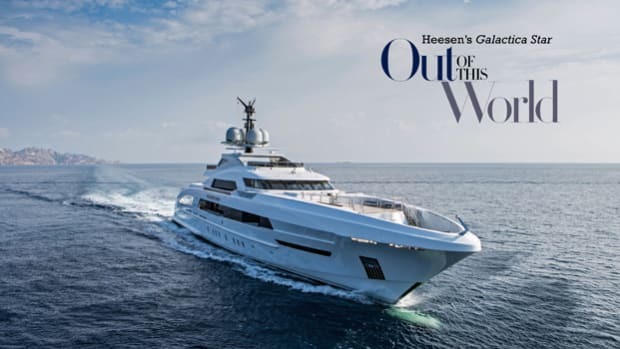 “Petra had a good feeling with them and thought she would have fun in working with them on the design,” Heesen explains. 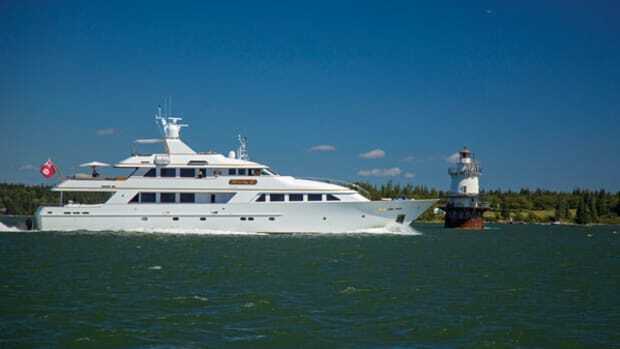 The couple visited the Bannenberg & Rowell design studio in March 2010, and the new yacht was in the works. The most obvious evidence of Lady Petra being family-centered is the family room/den forward on the main deck. She’s likely the only Heesen 47M displacement series launch to have such a space here, and likely one of only a handful of yachts worldwide to do so. The room was a must for the Heesens, so that everyone could gather together to enjoy movies. Alternately, the grandchildren could be there by themselves, watching cartoons or playing with their toys. Even being on the main deck, this room is far enough away from the dining area and salon to ensure the adults the privacy (and peace) they want. Related to this, Frans and Petra Heesen have their stateroom on the upper deck, aft. The bedroom opens out onto a private alfresco dining area as well. If the weather is inclement, or the Heesens simply want to relax a while before joining the rest of the family, they can enjoy an intimate breakfast inside their stateroom, which is served by a small pantry near the pilothouse. “Petra and I have our own rhythm, which is not the same as our kids and grandkids,” Frans says. Now, placing a breakfast nook inside a stateroom, even a full-beam one, can eat up precious floor space. However, the table rotates, a clever solution to saving room. It’s especially clever because it lets the Heesens more easily get in and out of the seats. That ease of access was another key design parameter. Consider, for example, the amount of stairs on a yacht. They can give a good workout to even the fittest individual, but unfortunately they also prove an obstacle for an elderly person. Even with limited mobility, guests can access every level and board easily directly from the dock. That latter point is particularly noteworthy. 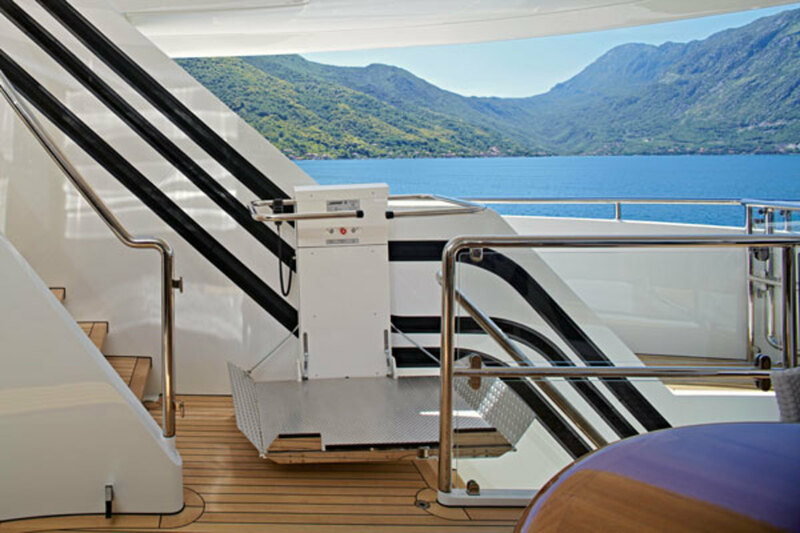 While yachts are increasingly featuring wheelchair-friendly elevators and passageways, the design and build teams sometimes forget that none of this matters if the person can’t use the passerelle. To solve this problem, Lady Petra has a platform that extends out for a wheelchair to roll onto, and then transfers the person to the main aft deck. From there, all interior rooms and passageways are accessible. But what if the family is gathered outside on one of the upper levels, such as the sun deck, which the Heesens’ grandchildren like? There’s a chair lift outside, akin to a stair-lift chair you might see in a home. It runs alongside the steps rising from the main deck. Upon first glance, it looks like a design element, since it follows the curves of the aluminum superstructure. It’s a practical solution that will surely find its way onto other yachts, especially if the owners live the way that Frans and Petra Heesen do. 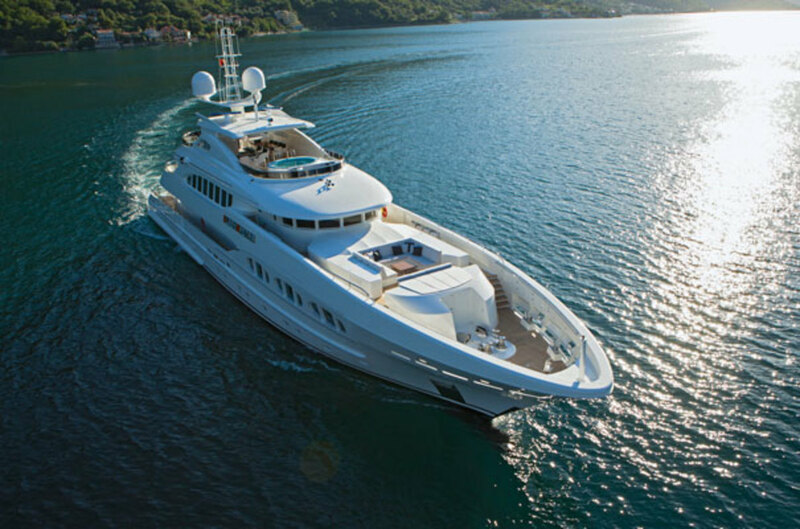 “We spend a lot of time on the sun deck, and we do really enjoy the Jacuzzi,” Heesen says. Even with the emphasis on family, Lady Petra pays homage to Frans Heesen himself, specifically his background as both a boatbuilder and a carpenter (which he was before he acquired the then-Striker shipyard 35 years ago). As you walk around Lady Petra, you’ll see drilled aluminum panels as accent pieces mounted atop high-gloss, rich-toned macassar ebony. 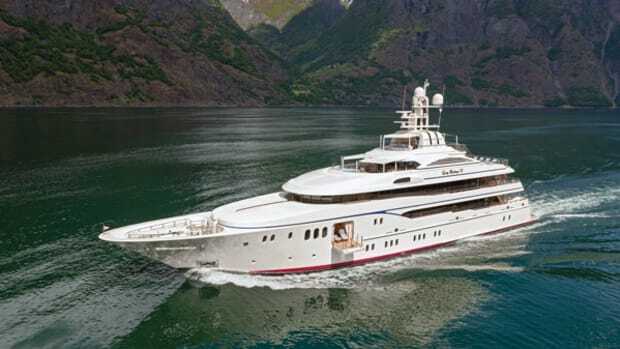 According to Bannenberg, the metal is a symbolic reference to Heesen Yachts’ focus on metal construction, and the joinery references both of Frans’ career paths. “It’s a nice graphic feature,” he says. 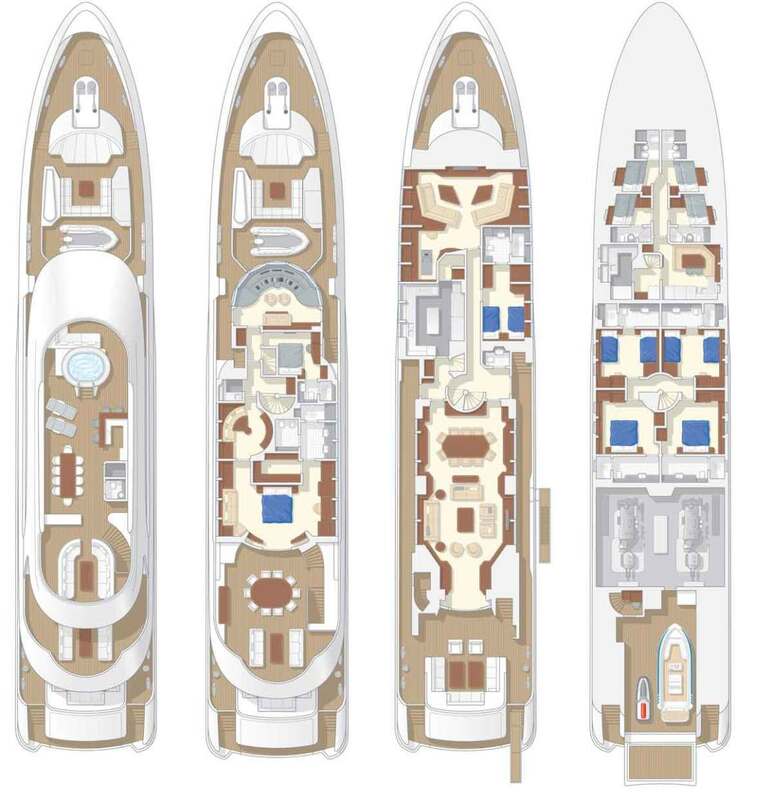 Another graphic feature is the ribbon of terra-cotta-toned leather on the bulkheads, soles and deckheads throughout Lady Petra. “It locks the whole interior together,” Bannenberg says. With these and the other materials used, such as ceramic tiles, marble and even bamboo (it is backlit and behind glass in the master suite’s steam shower,) “the feedback was unremittingly positive,” he says. Minor changes were made along the way, such as redesigning some furnishings without sharp corners and with legs that the grandkids couldn’t trip over, but the fundamentals were kept. “We knew we were on the right track really quickly,” he adds. It helped having every design meeting attended by Frans and Petra Heesen as well as their two sons. 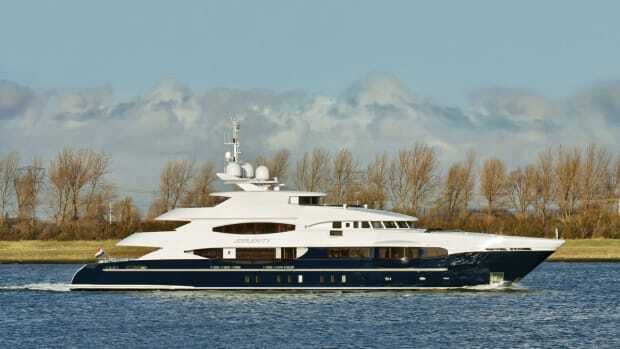 “It was always made very clear, from day one, that it was a family boat,” Bannenberg explains. That family boat was put to good use this summer. 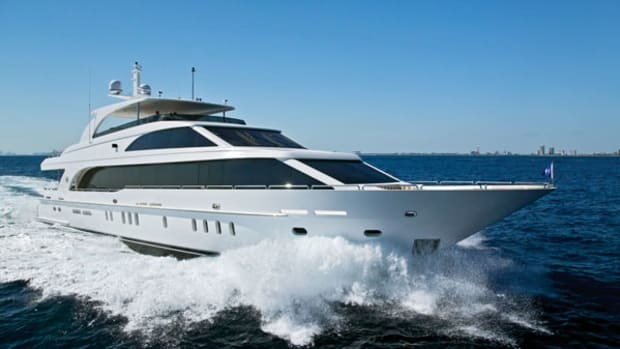 “The boat performs well, and we feel very safe, even in heavy seas,” Heesen says. The latter occurred in the Bay of Biscay, which borders France and Spain, during Lady Petra’s maiden voyage. 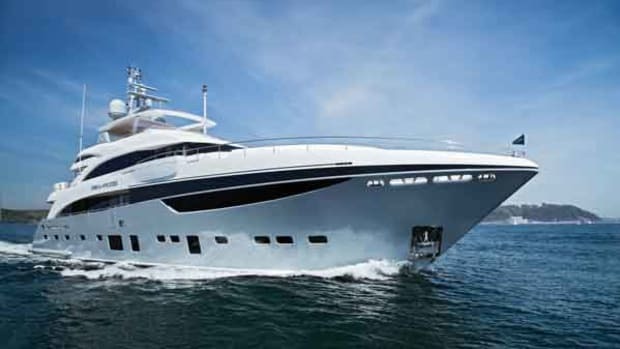 The yacht is equipped with twin MTU engines, providing a reported 15.5-knot top end (light load) and 12-knot cruising speed. 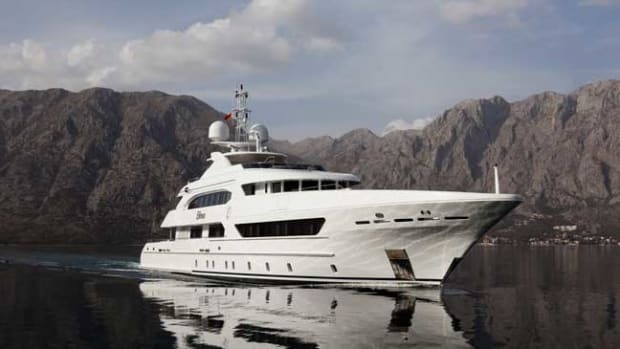 Being the founder of Heesen Yachts—a company he remains involved with, despite retirement—obviously made Heesen comfortable commissioning the yacht. But, he says, there still needs to be chemistry with a design team. “They have to be able to understand you, your habits, the way you are going to live on the boat,” he explains. And understand they do. As much as Lady Petra is a yacht, she embodies the personality of a man who is, and will always be, in equal parts a businessman, a husband, a father and a grandfather.